But do they have to be this close? 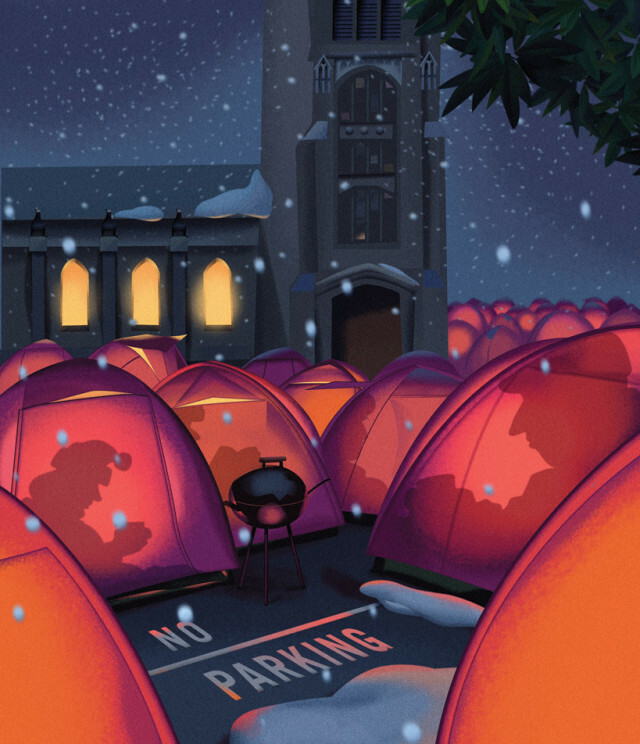 One church’s struggle with hosting a homeless encampment. THE SLEEPOVER WAS UNFOLDING the way sleepovers with 10- and 11-year-olds always unfold. Nobody was sleeping. I was chaperoning our church’s annual fourth- and fifth-grade winter overnight, and though we’d tried to exhaust the little beasties with a rip—roaring game of flashlight tag through the sanctuary—just please don’t knock over the pulpit—they weren’t about to close their eyes. They lay on their warm down sleeping bags strewn with pizza crusts, jockeying iPods. Occasionally one would erupt in a guffaw. Occasionally a different sort of interjection would drift in from the parking lot outside, where a different sort of sleepover was under way. A year ago this month the Nickelsville homeless encampment, an itinerant community of some 90 individuals, asked to live for three months in the parking lot of the church I belong to, University Congregational United Church of Christ. Technically illegal due to city permitting regulations and therefore not definitively covered by the church insurance, hosting them raised serious liability questions. But the more burning issue for this congregation of liberal Christians was this: How can we most effectively serve the homeless? To me the answer had always seemed plain: permanent housing. Pouring resources into stopgap measures struck me as shortsighted, even enabling—and it was hard to see Nickelsville as anything but a stopgap measure. The self—governing shantytown had gelled a few months earlier—its name a political jab at the municipal government they saw as hostile to its needs, its ultimate vision a community where they could sink roots. But by the time they came knocking at our parking lot they’d had to move several times. If you will give us a home for three months, they said, we will work on finding ourselves a longer-term site. Hmm…a field of pink tents donated by the Girl Scouts, pallets, and porta-potties? Not exactly the kind of solution I imagined would get to the root of the problem. And a fourth- and fifth-grade sleepover? That day we were astonished to learn that all three child-care centers supported inviting the homeless onto our grounds. Having learned that sufficient security would be in place, they were all for it. Perhaps the directors of the centers were just that attuned to the vulnerable. Without an invitation from the church Nickelsville would probably disband, its residents most likely vanishing into the streets. On any given night last winter there were 2,600 more homeless than county shelters had beds. The city’s Ten-Year Plan to End Homelessness prioritizes the creation of permanent over emergency housing, but it’s a policy that doesn’t address the immediacy of the need. “When you’re homeless you can’t wait for a 10-year-plan,” argued a supporter. “It’s about where you’re going to lay your head tonight.” The long-term solution certainly didn’t address the perfect storm of condo conversions, home foreclosures, and freefall recession that was transforming more Seattleites into homeless persons by the day. The vote came down two to one in favor. And so the Nickelodeons, as they called themselves, spent the harshest winter in recent memory in our church parking lot. They were respectful guests who played by the rules and thanked us incessantly. Just like housed populations, they came in all types. Some worked hard around the encampment. Others were layabouts. Still others worked for pay, like resident Al Farr, whom the church hired to shovel snow from its front steps when it mounded in two-foot drifts up the sides of the Girl Scout–issue tents. Farr was a big, quiet guy who was saving his money to see family in Greece. Until he had enough money, he had Nickelsville. When he died of a chronic health condition in his tent several months later, he was mourned and memorialized in short order. Less time, no doubt, than it takes many homeless dead to be found—much less identified. “Hey look, guys! There’s Spike!” My daughter and a few of the warm overnighters were watching the cold overnighters through the windows of the church lounge, when she spied the gentle, funny Vietnam vet I’ll call Spike. She and her friends had served him turkey at the Thanksgiving feast the neighborhood churches had laid out for Nickelsville, where the kids served and cleaned and cracked up at Spike’s knock-knock jokes. I wonder where that engineer is now, if he could possibly still be shoe-leathering it from Nickelsville’s current unauthorized encampment, a piece of Port of Seattle land in West Seattle. That’s where they are as I write this, anyway. In a couple of weeks, days after celebrating their one-year anniversary, the encampment will be “swept”—the city’s term for forcible removal—unless they find another site first. By the time you read this, Nickelsville might have disbanded altogether. It might have become the thorn in the side of some other municipality. Or it could be causing some other church community to lie awake at night overturning its comfortable assumptions about what “getting to the root of the problem” really looks like.